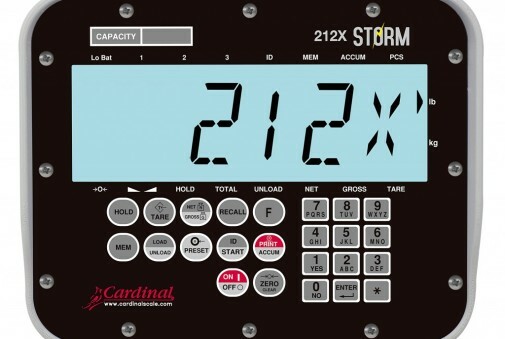 The USA-made Cardinal 212 and 212X Storm are designed for non-commercial agricultural weighing applications and are equipped with a polycarbonate enclosure featuring rear shock absorber mounts combined with either a 0.8-inch/20 mm or 2-inch/51 mm high back-lit LCD with 12 or 6-digit displays. Features include remote inputs for Start, Zero/Clear, Print, Tare and 2XX-KEYFOB functions, numeric keypad, a count feature with accumulator, 3 Preset Weight Comparators (PWCs), plus digital fill control with Load or Unload operation and 100 ID locations including Load Count and Net Weight. Supports up to 8 350-ohm load cells.